Our practice is supported by a dedicated staff that assists the veterinarians in providing veterinary care and in assisting clients with information. Our practice manager oversees operations, while the registered veterinary technicians perform diagnostic and medical procedures to help your exotic pets. Our veterinary assistants care for animals, help clean facilities and equipment, and otherwise help the practice run well, while the receptionists greet you, help schedule your appointments, and check you out so you can continue on with the rest of your day. We thank you for the opportunity to care for your exotic pets. Jim is the practice manager and a registered veterinary technician (RVT). He received his degree from Stautzenberger College in 1999. 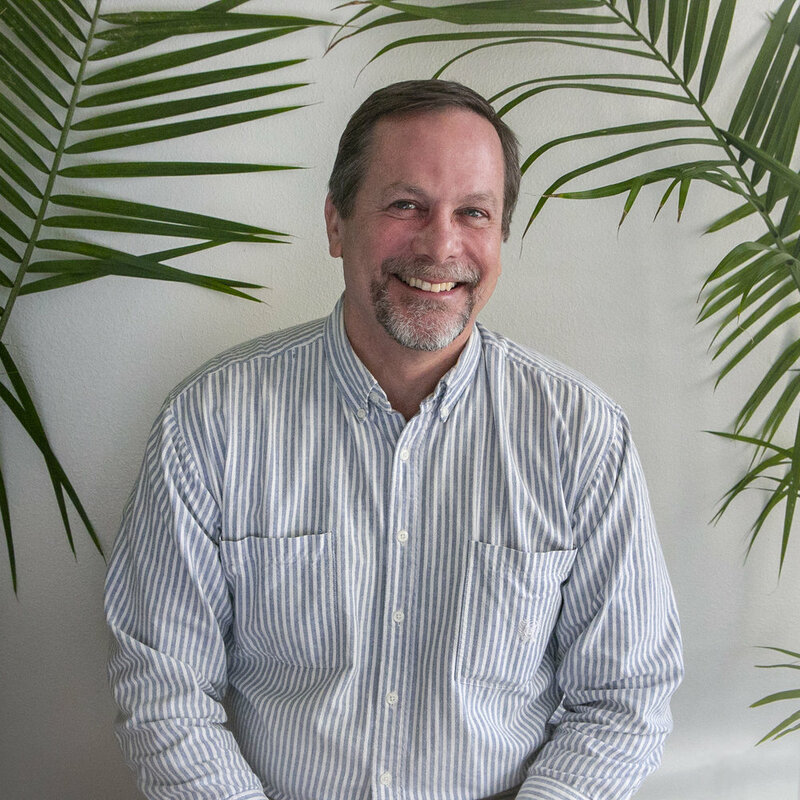 Jim began his RVT career by working with Dr. Orosz in 2000, then moved onto work in emergency animal medicine at Med Vet Toledo for over 14 years. 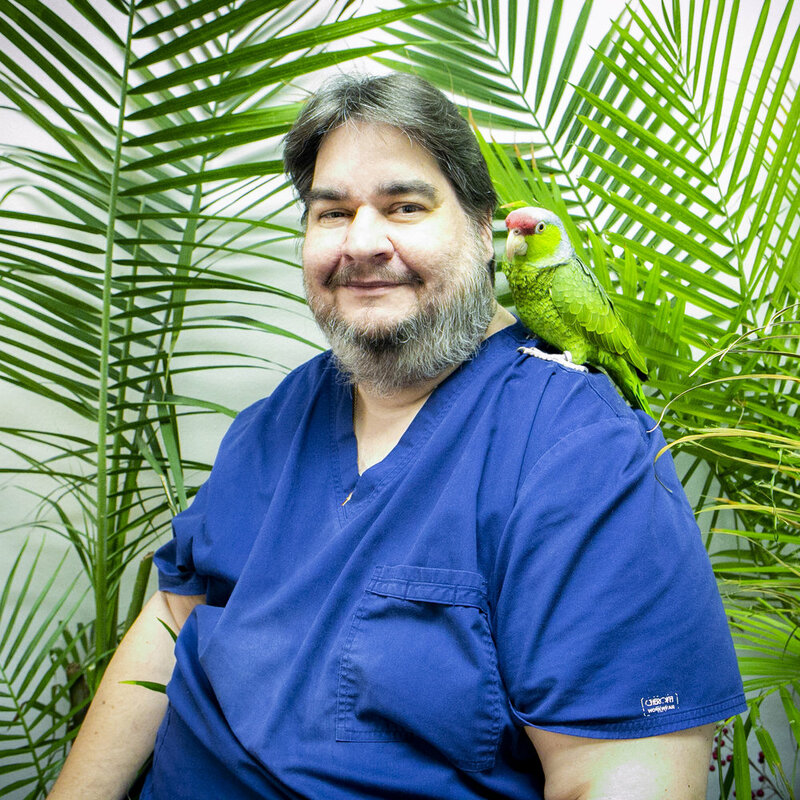 He returned to working with Dr. Orosz in 2016 and acts as the practice manager at Bird and Exotic Pet Wellness Center, setting policies, procedures, and schedules to keep the practice ship-shape. Jim and his wife have enjoyed raising two children into adulthood and now share their home with 2 green cheek conures, a green aracari, a lilac-crowned Amazon, a double yellow-shouldered Amazon, and three beagles. Jim holds a particular kind of love in his heart for our duck patients. Lisa received her bachelor’s degree in photography from Ball State University in 2005, then went on to work in a Muncie-based camera shop and photograph weddings and events professionally. 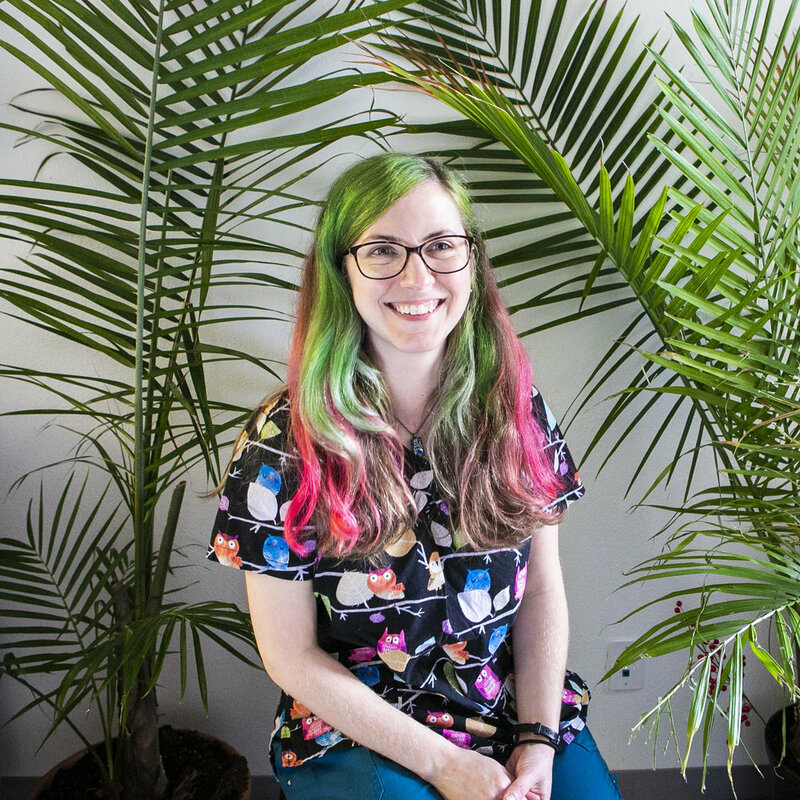 In 2010, she began working for an Indianapolis veterinarian and volunteering for a local wildlife rehab center, which help solidify the decision to return to school to pursue a veterinary-based path. She received her associate’s degree in veterinary technology from Purdue University in 2016 and achieved registered status in that same year. Lisa enjoys drawing, photography, taking nature walks in local area Toledo Metroparks, watching films, and spending time with her two cats, Bee and Grace. Jenn works full time as an assistant/receptionist while keeping a busy schedule outside of the practice working as a volunteer firefighter/EMT, as well as working towards her Veterinary Technician degree at St. Petersburg College. She has had several years working in the veterinary field as an assistant/receptionist and has always had a passion for animals. She grew up with a variety of them, ranging from small pocket pets, cats and dogs, to horses. She currently is a proud owner of three cats (Rubah, Obi, and Pi); two parakeets (Cricket and Flip); and Snow, the cockatiel. Outside of work, Jenn enjoys outdoor activities and plays on several sand volleyball leagues. Dania joined the Bird and Exotics team in 2017. She is near completion of her veterinary technology degree from Stauzenberger College. She is currently working on her volunteer hours for the program at the Toledo Zoo and a nearby small animal practice. Dania is scheduled to complete her degree and receive technician status in 2019. Dania lives at home with her beloved pitbull, Sheila. Chris has been with Bird and Exotics since completing his externship from Stautzenberger College in 2017. He graduated that same year. Chris loves reptiles, especially snakes, and enjoys building his own enclosures for them. Chris holds a particular interest in the breeding and husbandry of reptiles. Chris’ human family members include his girlfriend, and two sons. Fur family members include a dog, salmon boa, bearded dragon, rats, and a Flemish giant rabbit. Eric is Dr. Orosz’s husband and works with the practice as a receptionist and all-around task manager. Eric is very fond of linguistics and language and is quick to entertain with a good pun, or joke. He has a background in professional writing and editing, particularly in environmental and veterinary fields. He grew up with many household pets, never realizing that animals would become part of his home and workplace.